One of the most common side effects of cancer treatment is cardiovascular disease, which substantially impacts long-term survivor’s prognosis. Cardiotoxicity can be related with either a direct side effect of antitumor therapies or an accelerated development of cardiovascular diseases in the presence of preexisting risk factors. Even though it is widely recognized as an alarming clinical problem, scientific evidence is scarce in the management of these complications in cancer patients. Consequently, current recommendations are based on expert consensus. This Guideline represents SEOM’s ongoing commitment to progressing and improving supportive care for cancer patients. Cardiovascular (CV) diseases compete with second malignancies as the leading cause of mortality in cancer survivors. Antineoplastic treatments nearly triple the risk for CV events over the medium and long term . Clinical management of these toxicities with the aid of multidisciplinary protocols for prevention, diagnosis, and treatment, decreases unnecessary antitumor treatment discontinuation and optimizes global patient’s outcomes . Although we do not have evidence-based prospective cardiotoxicity scores to stratify the risk for cancer treatment-related CV complications, data from clinical trials and real-life registries enable us to recognize populations at increased risk. Table 1 summarizes the most common variables increasing cardiotoxicity risk [3, 4, 5]. At baseline, minimizing the use of potentially cardiotoxic therapies, if established alternatives would not compromise outcome, is critical to decrease CV events [7, 8]. 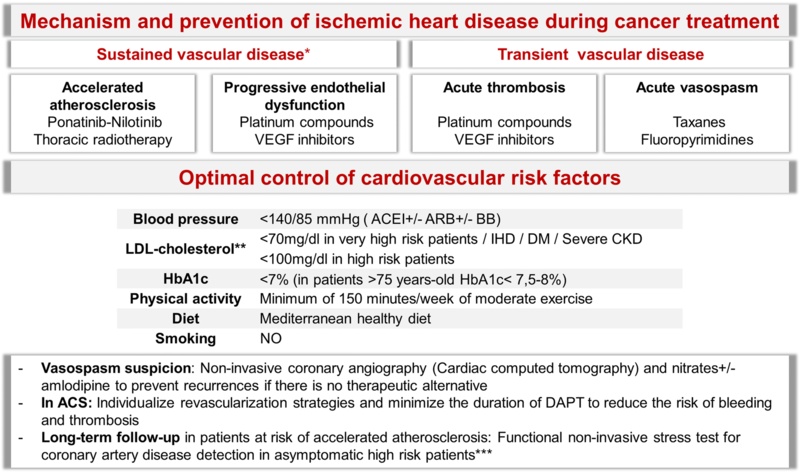 Optimization of CV risk factors and previous CV conditions is mandatory, as well as a structured advice regarding a healthy lifestyle (diet, smoking and exercise). 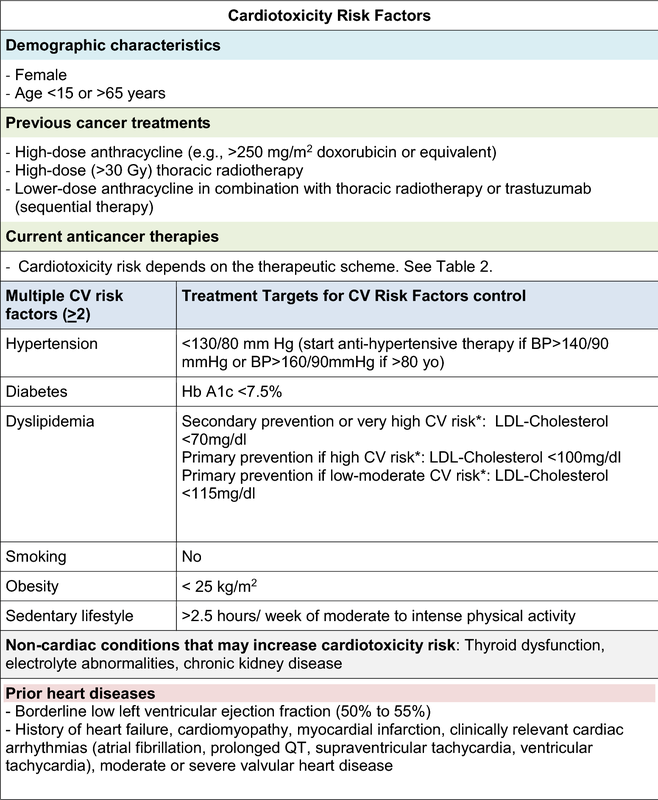 CV risk stratification with the EAPC’S HeartScore (https://heartscore.escardio.org/2012/calc.aspx?model=europelow) helps to define specific therapeutic goals for CV risk factors’ control (Table 1) [3, 4, 9]. Baseline echocardiography, in patients at risk for heart failure (HF), helps to optimize CV therapy and to define individuals requiring a close supervision during therapy . Universal primary prevention based on standard HF drugs is controversial and only small studies have demonstrated clinical benefit in high-risk populations [11, 12, 13, 14]. During and after therapy, continuing CV risk control and active CV monitoring are critical issues. 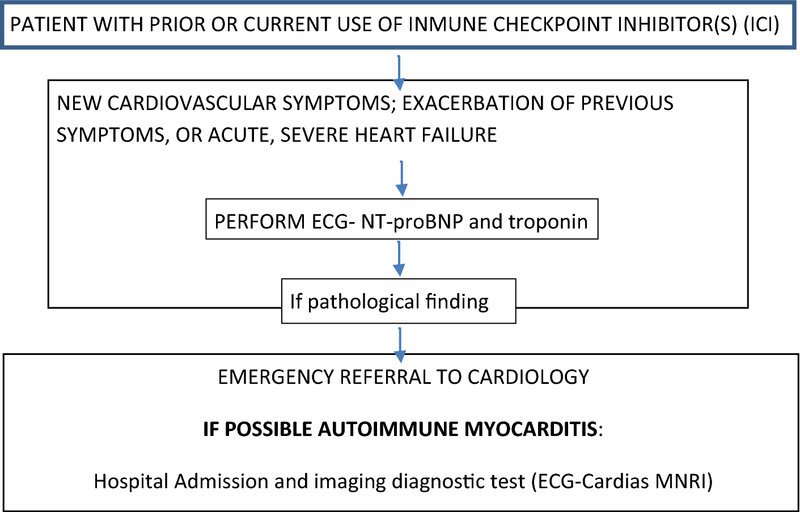 Cardiac biomarkers (e.g., cardiac troponins) and echocardiography in patients at risk for HF allow for early detection and treatment of subclinical myocardial damage, thereby preventing further events . History and physical examination: recording the presence of cardiovascular risk factors (CVRF), preexisitng structural heart disease (Table 1), and prior cardiotoxic treatments [3, 4]. Electrocardiogram (ECG): if abnormal a cardio-oncologyconsultation is recommended . Cardiac biomarkers: cardiac troponins are considered an alternative to serial echocardiograms in the ESMO Guidelines for cancer treatment monitoring in patients under anthracyclines ± trastuzumab or tyrosine kinase inhibitors [19, 20, 21]. Baseline values are needed to evaluate significant changes during follow-up. Imaging techniques: echocardiography is deemed the technique of choice when undertaking a global comprehensive assessment of cardiac structure and function at baseline and during the cancer process. In patients with poor image quality, cardiac magnetic resonance is the best option to avoid the radiation associated with nuclear medicine techniques [3, 4, 16]. Monitoring protocols during treatment should be adapted to both the availability of local resources and the professionals’ expertise [3, 4] to avoid unjustified delays in cancer treatment. 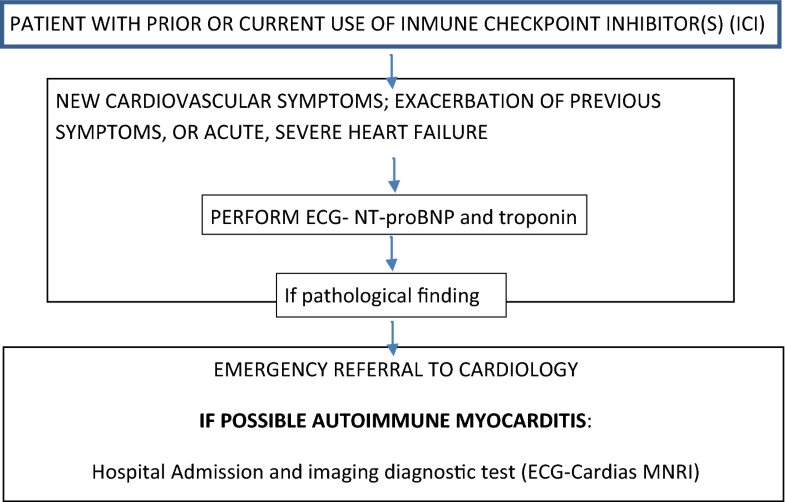 Figure 1 summarizes the monitoring process in patients at risk for developing heart failure. Myocardial dysfunction and heart failure (HF) are nowadays the most common recognized cancer therapy-related CV complications and much of the focus has been in the early detection and prevention of HF. Doxorubicin is associated with a 5% incidence of congestive HF with a cumulative lifetime dose of 400 mg/m2. Cardiotoxicity risk increases with higher doses (48% at 700 mg/m2) . However, recent studies have demonstrated that there is truly no safe dose of anthracyclines and HF rates can be up to 10% with standard doses in patients > 65 years or with preexisting CV risk factors or cardiac diseases . Acute toxicity is rare (1%) and usually manifests as supraventricular arrhythmias, transient LV dysfunction, or electrocardiographic changes (QT prolongation). For a long time it has been considered that subacute anthracycline damage was irreversible. However, active monitoring allows us for early diagnosis of HF and early treatment, ideally in asymptomatic patients, may change the natural history of anthracycline toxicity. Therefore, modern registries found 98% of cases diagnosed during the first year of treatment in asymptomatic patients [4, 20]. Cyclophosphamide cardiotoxicity is relatively rare (generally occurring at higher doses > 140 mg/kg) . Cisplatin and ifosfamide are uncommon causes of HF, usually due to volume overload during treatment infusion. Docetaxel also appears to increase HF risk in patients with preexisting cardiac diseases . 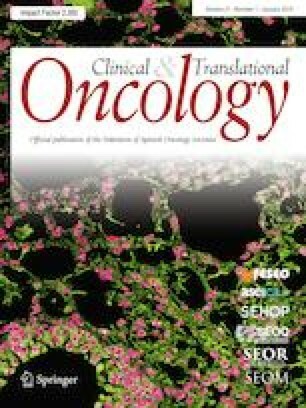 In several large-scale trials of adjuvant therapy in breast cancer, the rate of trastuzumab-related cardiac dysfunction ranged from 7 to 34%, with HF class III or IV rates between 0 and 4% .The risk is higher in patients with preexisting CV diseases or hypertension and lower in anthracycline-free regimens . Anti-VEGF antibody (bevacizumab) induced LV dysfunction in 2% and TKIs (sunitinib, pazopanib and axitinib) in 3–15% . Practical recommendations for patients with symptoms of HF or significant changes in LVEF [3, 4, 25]. Confirm echo data of left ventricular dysfunction (repeat echo at 2–3 weeks). Evaluate symptomatic status and check NT-proBNP. If LVEF is < 53% or other pathologic findings are noticed the patients must be referred to the cardio-oncology unit to consider HF therapy and a multidisciplinary discussion is needed to reevaluate cancer treatment strategy. New European Society of Cardiology clinical practice guidelines define arterial hypertension as a blood pressure > 140/90 mmHg in the office or > 130/80 mmHg during ambulatory measurements . Hypertension is the most common comorbidity in cancer patients [3, 4, 21]. It is present in more than 30% of patients, due to both the high prevalence of hypertension in aged cancer populations and the effect of certain anticancer drugs. Oncological therapies cause hypertension through different mechanisms, although the most frequent are drugs that inhibit angiogenesis and interact with vascular endothelial growth factors such as VEGF inhibitors (e.g., bevacizumab), tyrosine kinase inhibitors (e.g., sunitinib), and sorafenib. It has been reported that VEGF inhibitors induce new hypertension or destabilizing previously controlled hypertension in 11–45% of patients . Blood pressure should be monitored before and during cancer treatment and properly managed, following standard pharmacological and dietary recommendations for the general population [3, 4, 26]. Blood pressure target in patients with uncomplicated hypertension is < 130/80 mmHg. Renin-angiotensin system blockers, betablockers and dihydropyridin calcium channel blockers are considered the drugs of choice, given their protective profile against the onset of HF. In uncontrolled patients double or triple therapy is recommended as well as the addition of antialdosteronic agents. Thiazides should be used with caution because of the risk of hypokalemia and QTc prolongation. The use of negative inotropics drugs (diltiazem and verapamil) is not advised as they block the CYP3A4 isoenzyme, which is involved in the metabolic pathway of some tyrosin kinase inhibiotrs like sorafenib . There are increasing data that a growing number of anticancer drugs could cause pro-arrhythmic cardiotoxicity [18, 28] (Table 2). Cancer therapy might produce electrophysiological changes, such as QT prolongation, as well as a wide range of cardiac arrhythmias, including bradyarrhythmias and supraventricular and ventricular tachycardias [3, 4]. Arrhythmias might be only slightly perceptible, yet cause severe symptoms or even sudden cardiac death. Oncological diseases themselves predispose to the development of arrhythmias, which may be present at baseline in 16–36% of patients [3, 4, 28]. Management of arrhythmias should be based on cardiac- and cancer-related life expectancy, quality of life, and complication risks [3, 4, 28]. Initial assessment of patients who receive potential QT-prolonging drugs should include a baseline electrocardiogram and regular monitoring of the QT interval during therapy [3, 4, 28, 29] (Fig. 2). Withdrawal of these drugs or administration under hospital monitoring should be considered, if corrected QT interval is > 500 ms or increased by more than 60 ms from baseline [3, 4]. Atrial fibrillation (AF) is the most common sustained arrhythmia in cancer patients. 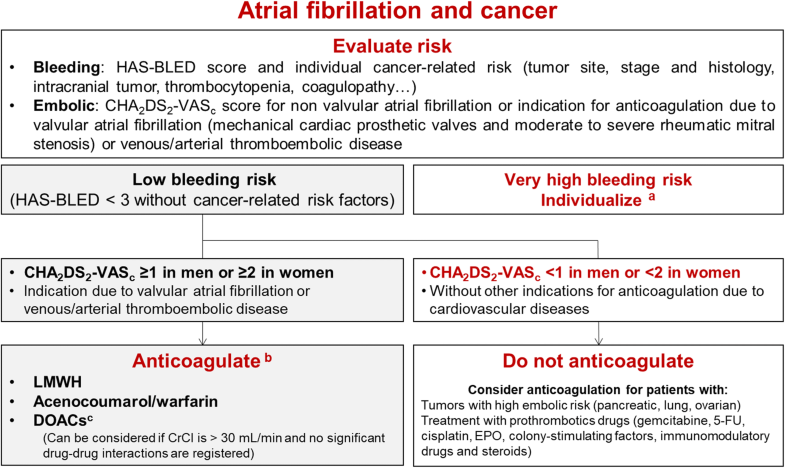 Treating AF in patients receiving active anticancer therapy is a challenge owing to several factors, including the need for frequent procedures, malignancy-related risk factors for bleeding and/or thrombosis, drug–drug interactions, and the choice of anticoagulant treatment. 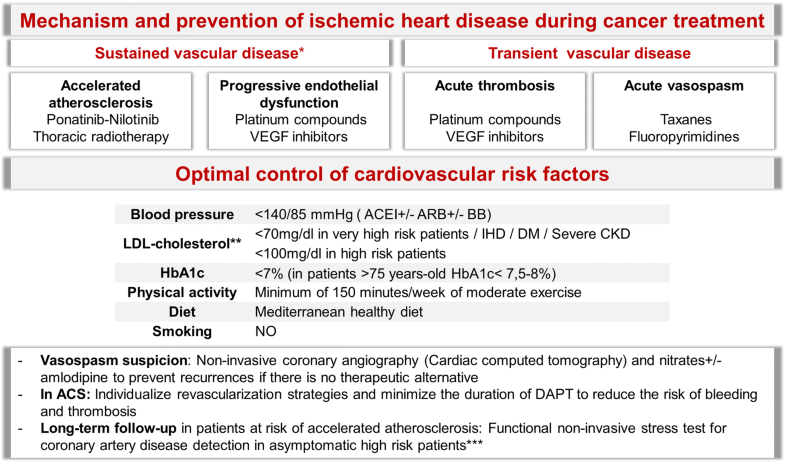 Nowadays CHA2DS2VASc score is recommended to guide embolic risk stratification (Fig. 3) [4, 30, 31, 32]. Currently, there is limited scientific evidence on the use of direct oral anticoagulants in patients under active anticancer therapy; however, they can be considered as an alternative, in stable patients, if no significant drug–drug interaction was registered . Despite the fact that cancer may induce ischemia by means of different mechanisms (Fig. 4), the most common ones are the sequelae from antitumor drugs and radiotherapy [3, 4, 33, 34]. Coronary heart disease (CHD) can debut as vasospasm, endothelial injury, or acute arterial thrombosis. Vasospasm has been reported during the administration of fluoropyrimidines or in the following days in up to 10% of the patients. Cisplatin induces endothelial dysfunction and arterial thrombosis, whereas VEGF pathway signaling inhibitors, such as bevacizumab, sunitinib, pazopanib, and sorafenib pose an increased risk of coronary thrombosis . Radiotherapy entails a higher incidence of ischemic heart disease by means of endothelial injury, plaque rupture, and thrombosis [33, 37]. In individuals with pre-existing coronary disease who require treatment with 5-fluorouracil, etoposide, bleomycin, vinblastine, bevacizumab, sorafenib, and taxanes, it is mandatory that CV risk factors be controlled and development of symptoms suggestive of angina be meticulously assessed. In patients with coronary vasospasm, and normal or non-severe coronary artery disease, nitrates or calcium antagonists’ treatment minimizes vasospasm recurrence and avoids treatment interruptions. Triggers such as anemia should be minimized [3, 4]. Both prognosis and management of neoplastic pleural effusion depends on the underlying neoplasia. Pleural effusion has been reported during treatment with targeted drugs, such as imatinib. Therapeutic approach comprises diuretic´s administration; however refractory dose reduction treatment discontinuation may be necessary . Myocarditis and pericarditis are rare complications of chemotherapy and/or radiotherapy. In both cases it can become complicated with pericardial effusion and needs non-steroidal anti-inflammatory drug treatment, combined with colchicine to reduce recurrences or pericardiocentesis if cardiac tamponade develops [3, 4, 37]. Pulmonary hypertension (PHT) is an uncommon, albeit serious CV side effect that appears after exposure to certain antineoplastic medications (TKIs, mainly dasatinib). Diagnosis is based on clinical evaluation, echocardiogram, and biomarkers (NT-proBNP). These patients require multidisciplinary evaluation to determine the best treatment strategy moving forward [3, 4, 39]. Radio-induced peripheral artery disease (PAD) mainly affects arteries and capillaries. Prevention depends on a strict CV risk factor control and treatment recommendations are similar other high-risk populations . Immune checkpoint inhibitors (ICI) are a new category of drugs that have had a great impact on the course of several advanced solid tumors. However, their use is related with immune system-mediated toxicities, including autoimmune myocarditis (AIM). Although cardiotoxic effects are uncommon, they are often associated with a high acute mortality risk. AIM prevalence increases under combination therapy and occurs more frequently during the first weeks of therapy . It can manifest either as de novo HF or as an exacerbation of an already known HF. When AMI is suspected a prompt cardio-oncology consultation is required High-dose steroids are recommended in critical patients although there is currently little experience [42, 43]. Figure 5 summarizes clinical approach in suspected cases. Cardiovascular disease and second cancers are the most common cause of mortality in cancer survivors . Long-term survivors that have been treated with cardiotoxic treatments or radiotherapy should be informed of their increased risk for cardiovascular diseases (CVDs). Cardiovascular screening reduces the incidence of heart failure by 18% , but there is a lack of agreement about the optimal test for screening and frequency of testing. We propose the algorithm recommended by Carver et al. and the Spanish Working Group in Cardio-Oncology [4, 46]. During follow-up, education in long-term cancer survivors should be based on lifestyle modifications, to prevent and treat CV risk factors, and instructions to report early CV signs and symptoms (Table 1) [3, 4]. Patients who need treatment should be referred to the consultant cardiologist or to the cardio-oncology clinic. Early treatment with ACEIs, ARA-II, and/or BB improves HF prognosis . In patients with high risk for radiotherapy-induced cardiotoxicity, ECO every 5 years is recommended [4, 33]. Cardiac dysfunction may first become apparent during pregnancy. Women who want to become pregnant should be carefully evaluated before, during, and after pregnancy . Patients with previous neck irradiation have an increased risk of stroke. Ultrasound scanning of carotid arteries to rule out the presence of subclinical atherosclerosis is recommended [3, 7]. Final recommendations, strength of recommendation and quality of evidence (Table 3). JAV has nothing to disclose. AMG has nothing to disclose. RDP has nothing to disclose. AS reports speaker honoraria from Roche, Pfizer, Astra Zeneca, Novartis, MSD and Pierre Fabre and Advisory Board from Roche, Tesaro, Clovis, Astra Zeneca and Novartis, outside the submitted work has nothing to disclose. RA has nothing to disclose. CB reports grants from LEO Pharma, Roche, MSD, ROVI, Sanofi, BMS and Mylan. Has received speaker honoraria from Esteve and Kyowa Kirin and Advisory boards from Kyowa kirin, Omakase and Roche, outside the submitted work. SC has nothing to disclose. JG reports speaker honoraria from Roche, Pfizer and Novartis, and Advisory board from Roche and Novartis, outside the submitted work. SG reports advisory boards from AstraZeneca, Celgene, Roche y Novartis. TL reports honoraria for teaching from Janssen-Cilag, Teva, Gilead, Daiichi, Novartis and Pfizer, outside the submitted work.